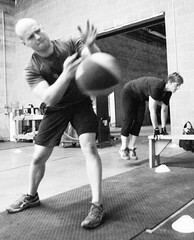 This class is geared towards those wanting to get a good workout in a dynamic group environment. Whether you are a college student, teacher, business professional or over the age of fifty, this class is for you. This class offers modifications (up or down) to assist you in obtaining your fitness goal regardless of age and ability. This fun and class will leave you feeling energized and will decompress any stress created throughout the day. This class is taught by Nancy McBride. Contact Nancy for more information and with any questions nancy@ptfitnessbootcamp.com. Most classes are held indoors, so be prepared to defend yourself against surprise elements like tires, humidity and elusive sasquats. 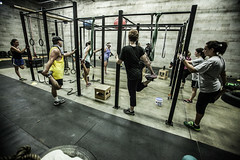 Be sure to wear comfortable sneakers and bring an exercise mat, towel, and small hand weights (5-10lbs).